Our last post closed with a cursory discussion of Donald Trump’s use of personal narrative during his successful campaign for the presidency of the United States. While I stated that I consider his discourse a relatively superficial effort at leading by autobiography, we are now seeing evidence that his stories of identity had a significant influence with some key elements of the voter population. In fact, a number of CNN’s news reports from the American heartland, particularly the interviews in a series they are calling “America Uncovered”, have caused me to comprehend just how much the new president’s tales of his life experience helped change the minds of vast numbers of these working class people. As always when I venture into the realm of politics, I would like to emphasize that my purpose here is not to defend or attack either candidate. Rather, I often seek to gauge how effective each of them was at using their personal stories to influence people and win votes. In the case of the recent US election, it has been well documented and widely discussed that few traditional mainstream media outlets—newspapers and television stations—gave Trump much chance of winning. On the day of the voting, CNN International stated categorically that this real estate mogul had no possible path to victory. Many big city papers had spent the previous weeks endorsing Mrs Clinton, some even ridiculing her Republican opponent. In various reports I saw in the second half of 2016, Trump’s discourse was termed simplistic, illogical, lacking specifics on policy, inconsistent, sketchy on facts, unrealistic, changeable, manipulative, populist, bordering on dangerous demagoguery, and so on. Then, on Election Day, as America and the world watched the race turn from the definite Hillary Clinton victory they all had predicted into a hotly contested battle, television news anchors appeared as astounded as anyone. “Nobody predicted this,” said Chris Matthews on MSNBC. “I don’t know one poll that suggested that Donald Trump was going to have this kind of night,” said Jake Tapper on CNN. “He is still in this, and I’m not sure a lot of us thought he would be at this hour,” said Chris Wallace of Fox News, just after 9 pm. After the voting, numerous interpretations emerged, as everyone tried to understand how so many pundits, analysts and commentators had been so wrong. While I certainly do not consider myself an expert in such matters, my hypothesis is that much about this remarkable outcome can be explained in terms of storytelling. In fact, I believe the polling agencies and news outlets simply underestimated the effect that Donald Trump’s personal narrative was having among undecided voters. That is precisely why I found CNN’s interviews of unlikely Trump supporters from Middle America so enlightening. 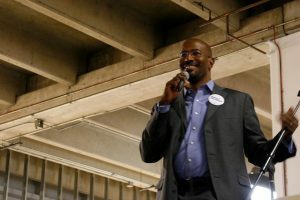 When journalist Van Jones ventured out and spoke with Trump voters from the white working class, he focused directly on individuals from staunchly Democratic areas, people whose families had never before voted for a Republican. Listening to their responses, I understood the extent to which they had taken Donald Trump’s stories to heart. These types of statements pervade the comments of these voters from America’s heartland. From my perspective, this is what they are saying: “She gave us no story to let us know who she really is, or to give us a reason to trust her.” In contrast to Barack Obama, she provided no uplifting or aspirational personal narrative. On the other hand, Trump provided these people with a story that evoked hope for change. Because he repeated a simple litany of personal stories over and over—providing a clear narrative that everyone can grasp—people have very clear ideas about exactly who he is and what he stands for. It was striking that, when prompted about what they now expect from their new president, these voters often recited the personal stories they heard from him: “He is a businessman. He has spent his life making deals. He will negotiate better trade agreements and better defense agreements for America. He is going to make the country safer. Look, he is already cutting deals with companies to keep jobs in the US. To me, the most critical question about Donald Trump in the early days of his presidency is: Can he embody the story he told? I’ll explain this concept a bit more in the next post. For those who would like to see what Van Jones discovered when interviewing the Trump supporters, you can click here.